I have a separate page dicussing scripts of all kinds, currently focusing mostly on formatting of a typed calling script, with downloadable example. This is something I've only thought of lately. Naturally when starting a document, especially one that evolves over the course of production, like a scene breakdown, entrance-exit table, etc., I find myself using a lot of question marks. Sometimes it's helpful to know at a glance how many things are left to be decided. Sometimes I forget to update things once I have an answer. If you're using a spreadsheet, database, or a word processor with advanced spreadsheet-like table features, you can create conditional formatting to automatically highlight your question marks. I like to set a condition that if a cell contains "?" that it fills the background in a light pink and makes the text red. The moment I remove the question mark, it goes back to being a regular cell. It's a very low-maintenance way to really make my questions stand out. I'm using a new template for this season's rehearsal and performance reports at The Reagle Players. It's based on the performance report I developed on the Acting Company tour earlier this year, except the fancy graphics are toned down a bit so that it will paste directly into an email without losing its formatting. I do my reports using the app Pages, which is part of Apple's iWork suite. The reports look basically the same in Word, except that the best part of the performance report -- the automatic calculation of the running time -- doesn't work, but you can just put it in by hand. The other thing that I like about it is that if you do your daily schedule as a table in another document, you can paste it right in within the "Tomorrow's Schedule" table. Here are some sample pictures of what the reports look like, and you can download a zip file containing both reports in either format. Have fun! It seems nobody makes a calendar that allows you to control what it looks like. I came into the business at the tail end of the era of the standalone calendar app. Time was, people sold programs that would allow you to design a calendar to look just how you like it, and to contain the information you want to share. Now, I guess they expect you to use Outlook or iCal, or some similar all-in-one app, which is a terrible way to go about producing a calendar for other people to use that has nothing to do with your own personal schedule. 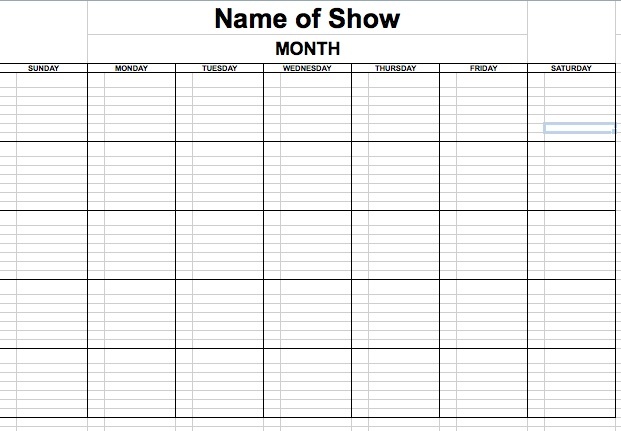 When I was production coordinator for the Florida premiere of the musical Bingo, I was lamenting this sad state of affairs over the phone to the company manager, and she said that she had a great Excel spreadsheet that I could use to make my very own calendar. She sent it to me, and I have used it (with some of my own modifications) on every show I have done since, and have in turn passed it on to many other stage managers and company managers. My favorite thing about this format is that it's completely flexible. If you're doing a show that runs a month from the 15th to the 15th, you don't need two separate pages for both months. Just make a calendar that starts with the first week and ends with the last. If your show runs seven weeks, there's nothing to stop you from making a seven-week calendar (aside from having to squish things a little). I use the squares on either upper corner for show logos. You can just drag your logo (or perhaps one show logo and one company logo) into the box and it should size appropriately. 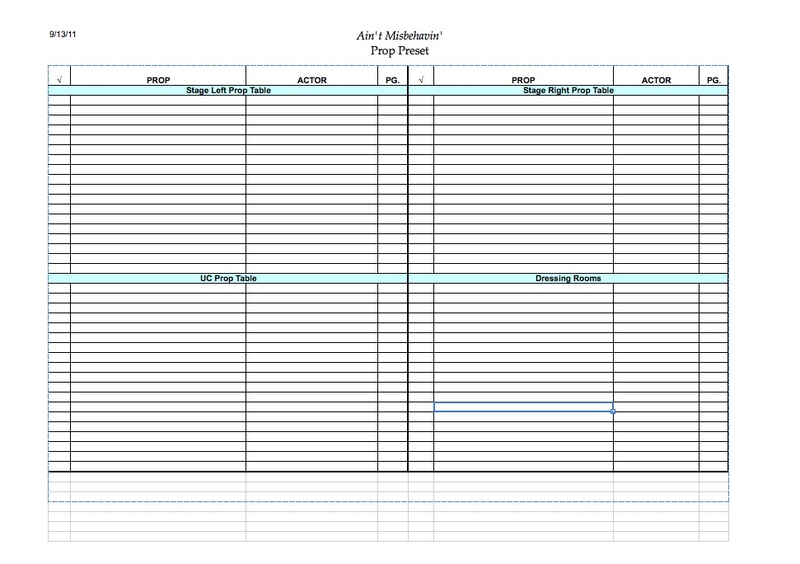 I have two basic formats I use for contact sheets. 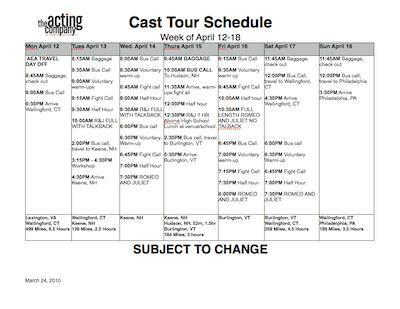 The one I'm really proud of is this one for what I would call "fancy shows" -- shows that are expected to run a long time and/or need a really robust contact sheet with lots of info beyond just the cell numbers and emails of the cast and creative team. 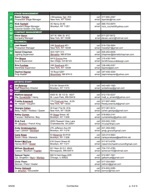 It can expand to as many categories as you need -- vendors, transportation, unions, alumni, etc. Appropriate uses would be Broadway, Off-Broadway, and tours. The other type I use is for more informal shows, or shorter runs. This is my standard for summer stock, where I need to fit tons of names but not a lot of information -- just job title, phone and email. The office keeps their own records of addresses and other info for payroll purposes, but in the few weeks the show lasts, there's not much need to hand out a big long contact sheet. Generally even with a 50-person cast, I can fit it on the front and back of a single piece of paper, which is much easier for people to keep track of than one that's seven or eight pages long. In a perfect world if you are doing a "fancy show" you probably want to also have a contact sheet of this style so that folks can carry around a quick list of the people they would need to call most often. An important consideration for me when designing a contact sheet (or any paperwork, really) is that it can use color to make it easier to read (especially on a computer screen), but the color contrast has to be such that it will still make sense when it's printed in black and white. A contact sheet in particular is something that's likely to be photocopied, so if you use color to separate different types of information, you have to make sure that it's still legible and that any differences in color that are used to identify something can still be told apart. I find that every show I do requires a little bit of creativity to shape my default contact sheet into something most appropriate for the situation. My templates have a bit of dummy information filled in to give you ideas of how I might use it, but feel free to make it your own. 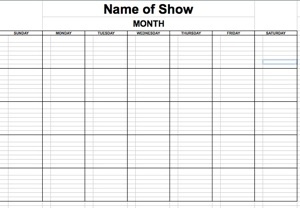 I've used this template for a couple years, most notably for my weekly schedules on The Acting Company tour. I found people either loved it or hated it. When I came back for my second year, I intended to come up with something different. 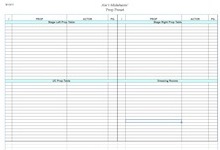 I gave up when I started receiving schedules before we started production, and found that in the intervening months it had become the default template in the office. 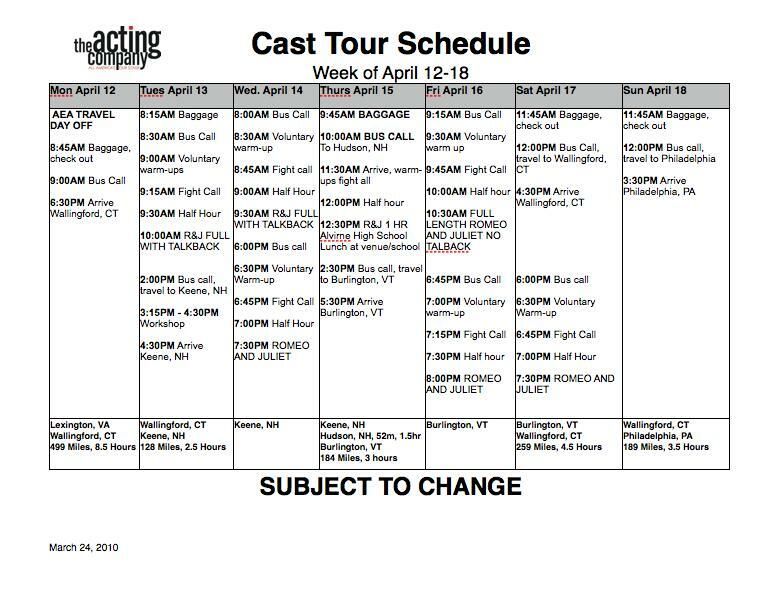 I very rarely used this template myself, mostly it was the domain of the company manager, whose weekly schedule outlines the travel and other things that take the cast from point A to point B, and then when we started touring our TD used the same format for the crew's schedule. I guess if everybody else liked using it so much, it's not too bad. 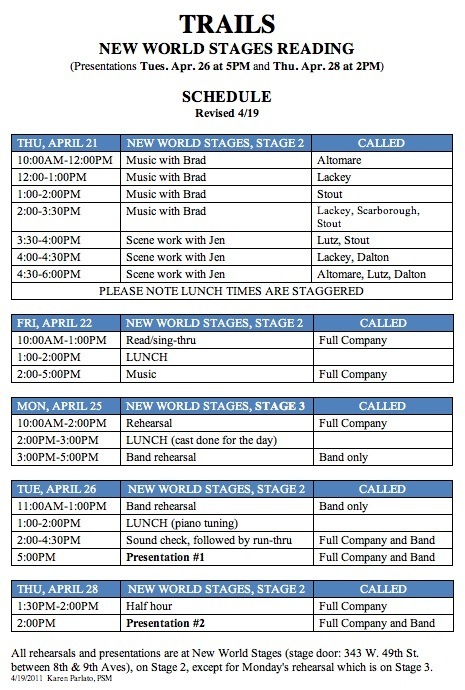 Above is an example of one of our tour schedules. 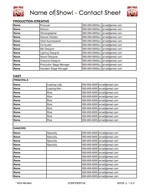 Download the blank in .doc format, though if you're a Mac user, I suggest working with this or similar templates in Pages, as it makes working with tables much more fluid and predictable. The .doc above will open nicely in Pages. Here's another format of schedule that I've used primarily for readings and other relatively simple events (it's filled out here for a reading). It's good when there's not a need for very detailed information, or multiple events happening at once. It gives a good overview what the week (or in this case, the whole process) is going to look like. There's no reason each entry needs to be just one line -- you could beef it up with more detail in each box if you wanted to. If the above schedule is sufficient to communicate everything that's happening, good for you! If you're doing a musical or another project where you are bound to have simultaneous things going on everyday, this one may be more helpful. 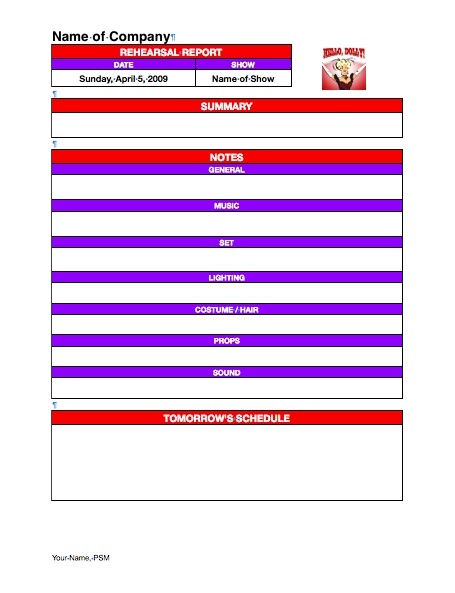 It's less of a template and more of an idea, since the exact layout will conform to whatever your schedule is on a given day, but take a look at this example from Hello, Dolly! (this is not technically a "weekly" schedule, but a mid-week revision, so it only has three days on it). Click to make big. 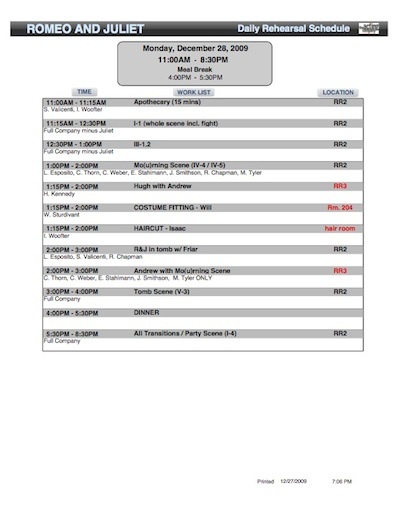 As I said, you will have to set up the tables and cells specifically for how your day breaks down, but you can download a .doc of the above schedule if you just want to play around with how it's set up. Same as the simple schedule above, perhaps even moreso, if you're on a Mac and can use Pages, you will enjoy this format much more. 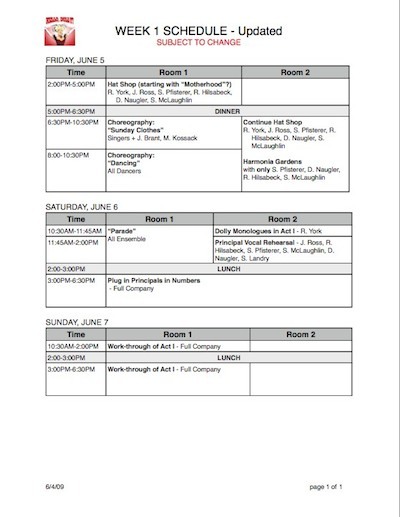 My daily schedule for musicals with multiple rehearsal rooms is exactly the same as the Complicated Weekly Schedule above. So similar, in fact, that I'm not going to link to it separately, because it's exactly the same, except instead of having six days on it, it just has one. You can use the above template, just delete a couple of the days. 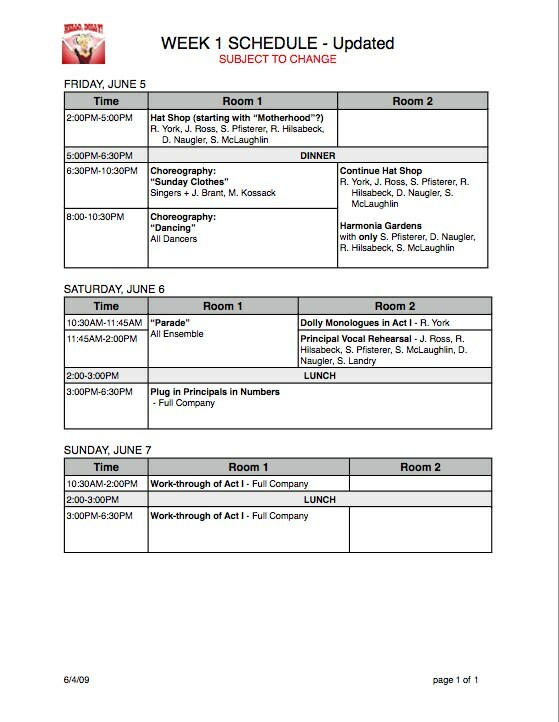 On the last Acting Company tour I had my daily schedule generated by my database, which is well beyond the scope of this page, and not yet ready for public consumption. So I can't actually share it with you, but I can show you the end result, which would be easy to replicate in a word processor. When I built the database, I thought this linear format was going to be an absolute disaster -- impossible to follow and too inflexible for things that might come up. I was kind of restricted by the type of layouts that are possible in order for the schedule to be generated dynamically by the database, where it would be difficult to show things side-by-side appropriately. I was pleasantly surprised at how well it worked. Nobody ever said they couldn't read it, even on some crazy, crazy days. And most important -- not a single actor ever missed a call because they mis-read the schedule, which is something I don't think I have ever experienced with any other format. The reason some rooms are listed in red is because the database knows what the "default" room for the show is -- in this case Rehearsal Room 2 at the Guthrie -- and will mark any other locations in red to catch the actors' attention that they're not going to the usual place. It was apparently effective: everybody always seemed to know where they were going. So in short, I didn't think this format would work out very well, but I was building the database a few days ahead of when I needed each part to be functional, and this was the best I could come up with for the schedule by first rehearsal. I can't explain why it works, but it does. 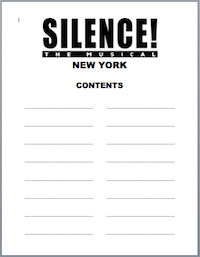 I got this template from my former ASM on the Acting Company tour, Meaghan Rosenberger. The moment she presented her first draft of a prop list in this format, I declared that I was stealing it. It has a very simple but easy-to-read layout, with just the right amount of color to focus your attention on the important parts without being distracting. This is a slightly simplified version of the one we used, as you can customize it to whatever other areas of the theatre you may need to set props. I have added one touch of my own, a master prop list on the first page, so you can track the design notes and acquisition of props, and then add them to the preset list once you know where they need to go, all in one document. The hardest thing about wallet cards is getting them printed. The template I'm about to share is designed for the Avery business card paper that has ten cards per sheet. Even with this information, there are so many different ways you can buy the wrong paper, it's mind-boggling (I screwed it up again this year). Most of the ways you can fail involve printing on the back. Now if you don't want to print on the back, your choices are much easier, but it's a nice place to put some extra information -- I like to use it for the company's unemployment ID number, and the worker's comp policy number. So first you need to buy the kind of paper that can be printed on both sides. However, what I learned this week is that it's not enough to buy the two-sided paper. You also have to be careful if you use an inkjet that you find paper specifically designed for inkjets. What I bought was not particularly emblazoned with anything saying otherwise, except in the corner where there was a little rainbow thing that said, "Now optimized for color laser printers!" as if the fact that I have ink all over my hands and ruined $10 worth of paper is a good thing. I guess part of "optimizing" it for laser printing is that they use the same coating on the back that they use on the single-sided paper, which inkjet ink comes right off of. So watch out for what you buy, and be aware that your local office-supply store may not carry all the various types to do a direct comparison. OK, now that you hopefully have the right paper, here's the template, in Word format. It's based on my wallet cards for the Acting Company tour. I have left the logo, colors and addresses in so you can see how I had it laid out. 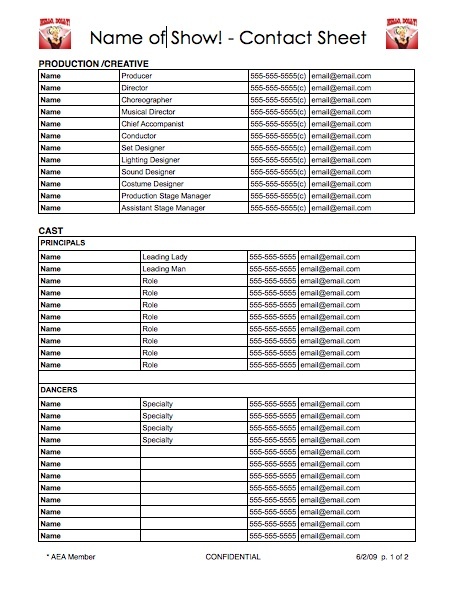 Feel free to change it, unless of course you are working for The Acting Company, in which case, most of your work is done! Once I have gotten the first card layout the way I like it, then I group all the elements and copy and paste them into each of the ten cells. It can sometimes be a little tricky because Word doesn't like playing with tables very much, from my experience. It's always a good idea to print on plain paper first so you can make sure everything looks good, and hold it up to your card paper so you can make sure the edges line up properly. You will probably also want to think about designing the cards in such a way that they won't look wrong if the printing is a few millimeters off. 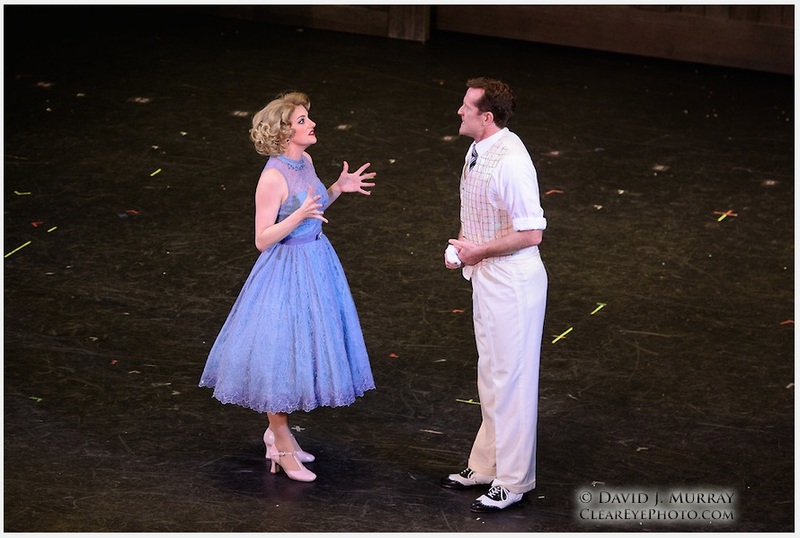 When rehearsing a musical, unless there's really not much movement or dance, it's usually required to have the edge of the stage marked with numbers in two-foot increments to facilitate choreography and spacing. If you're going to be really fancy you can use pre-made sturdy numbers that you would find in a hardware store. If you don't need something so permanent, or for a rehearsal room where you need to be able to remove the numbers cleanly (maybe even every day), printing your own is much cheaper and easier. It's also an excellent solution for moments of "oh crap we have to move studios for the next 4 hours and don't have numbers!" All you need is a printer, scissors, and one of my favorite tools: a folded piece of construction paper 2 feet long, which when you need to throw down some numbers in a quick-and-dirty manner, is faster and less obtrusive than using a tape measure. I have a PDF with a full set of numbers that goes up to 20. Here it is, if you'd like to use it. 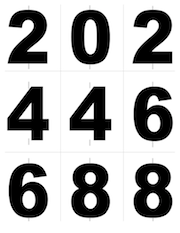 It also has guide lines for where to cut the numbers apart, and the centerlines of the numbers. When you're really, seriously, doing a dance show, sometimes you need an additional number line upstage. Hiding it is a lot more difficult because if you've got a balcony the audience is probably going to be looking at it all night. When I did White Christmas the stickers we were given weren't discrete or attractive enough even for downstage. 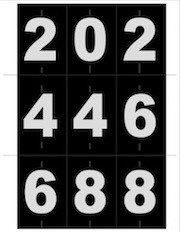 We decided to customize my standard number line (which is big and ugly for rehearsal purposes) for a gray-on-black version with just the right amount of visibility. Originally we made two sets, with the upstage numbers even darker, but it didn't pass the "hey can you guys see this?" test, so we used the lighter gray for both. You're going to need a lot of ink for this, so make sure they're taped down well. Also your upstage line is probably going to get danced all over, so for everyone's sake, make sure it's nice and smooth! This production shot gives a good view of what the numbers look like onstage. When working under an Actors' Equity contract, one of the first things to happen in the rehearsal period is the Equity meeting. Here votes are taken on a number of subjects, such as the length of the lunch break, and a number of other rules mostly pertaining to how the rehearsal hours are used. The stage manager needs to provide ballots for everyone to cast their votes, and then calculate the results. I have an Excel spreadsheet I use for this purpose. 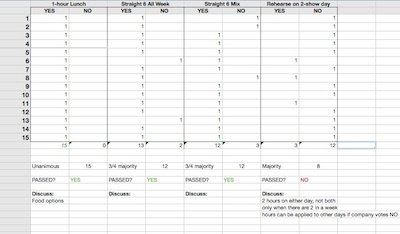 The one shown above, which you can download is set up for four different votes (which in this case are the length of lunch break, whether the company can do "straight-six" rehearsals all week, "straight-six" mixed with full-length rehearsals, and can rehearse on a two-show day). The options are different under different contracts, this one happens to be for LORT. 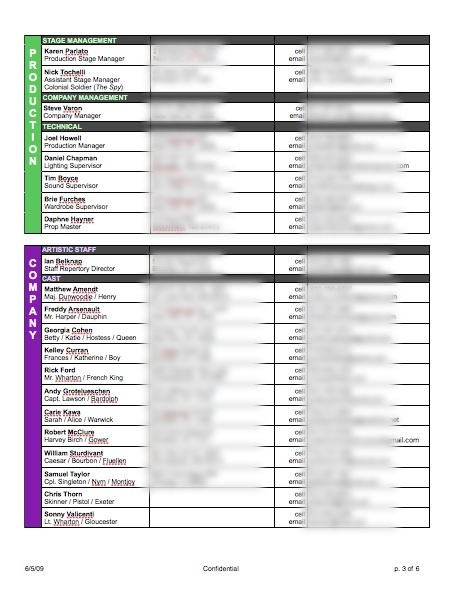 The spreadsheet is set up for 15 ballots (in this case, 13 actors plus 2 stage managers). As the ballots are anonymous, the numbers 1-15 mean simply the order in which you open the ballots. If ballot #1 voted "YES" for the 1-hour lunch, put a "1" in the YES column for that question, and so forth. 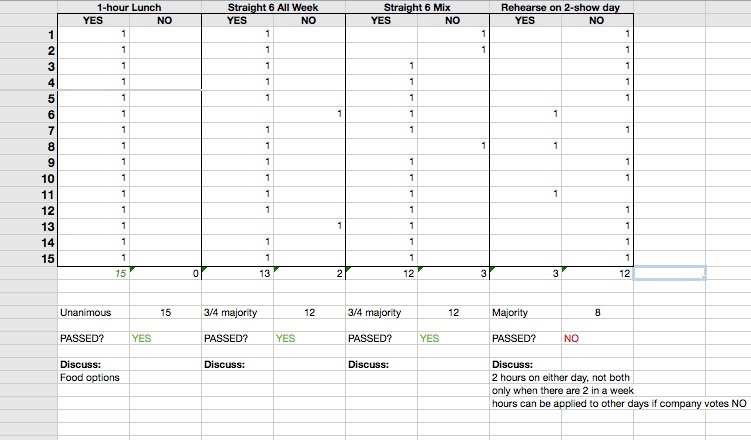 The sheet will add up the number of votes, and based on the number you enter in row 21 (check your Equity rule book for what kind of majority you need -- i.e. simple majority, unanimous, 3/4, etc.) will tell you if it passed or not. The "discuss" section at the bottom is something I added to remind myself of any pertinent information I should tell the company to clarify what they're voting on. For instance, in voting on the length of the lunch break, they should be made aware of how far they have to travel to get food. There comes a sad day in any stage manager's life when a show closes. And then there usually comes the even sadder realization that for some reason you're responsible for packing up the props. If you're lucky, your show may be intended to have a life after the current production closes, in which case things need to be clearly labeled so they can be pulled out of storage and easily found if the show is remounted. Here's a very simple template for listing the contents of any kind of container.